THE STUFF OF SATURDAYS: deck the hall, bruise your hand. Before I really even start, I would like to wish you all…HAPPY HOLIDAYS [whichever one(s) you celebrate] AND HAPPY NEW YEAR! If you can tell where the title of this post is from…you may or may not have a higher chance of getting a prize in the near future! ;] *wink if there ever was one. * It will help you out if you decide to enter the contest! Please read the whole thing. I’ll send you cyber cookies. 🙂 They’re invisible though, so good luck finding them. 😛 And if you read the whole thing, I swear you‘re gonna get something out of it. (Like CONTEST PRIZES MAYBE?!? HUH, HUH?) Also, I’m sorry, I know it’s long. so let’s see whats in store for today. please note that “Contest+The Key” is orange. clearly, it means something. I have a lot of music for you guys this week, and you may want to pay attention. It will affect you if you want to enter in the contest I will talk about later. This week, I actually have a few songs (seeing as I haven’t posted for about a month…sorry, the constant schedule changes kinda muffed things up). My favorite songs right now are “The Tables Are Numbered for a Reason, Honey, You Just Haven’t Thought of It Yet” by Panic! at the Disco and “What a Catch, Donnie” by Fall Out Boy. Earlier this week, however I really liked “The Good Left Undone” by Rise Against. The lyrics are phenomenal. I’m also loving “Smile Like You Mean It” by the Killers, which is actually one of my favorite songs of all time! My favorite band, as of now, is probably Panic! at the Disco, even though they are one of my all-time favorites. I love almost their songs, and A Fever You Can’t Sweat Out is probably the best album of all time. OF ALL TIME! Some other songs by them that I’m really enjoying that aren’t listed above (I didn’t want to fill it with just P!ATD songs) are “I Constantly Thank God for Esteban” and “But It’s Better If You Do”. Bands I’ll Always Listen To. No Matter What. This Week’s Edition: PARAMORE! Part Deux. ALL WE KNOW IS FALLING: Pressure, Emergency, Franklin, and My Heart. RIOT! : For a Pessimist, I’m Pretty Optimistic, That’s What You Get, Hallelujah, Misery Business, Miracle, crushcrushcrush, Fences, and Born for This. BRAND NEW EYES: Careful, Ignorance, Playing God, Brick by Boring Brick, The Only Exception, and All I Wanted. There go our appetizers. Or hors d’oeuvres as the lovely French call them. Let’s move on to the entree. 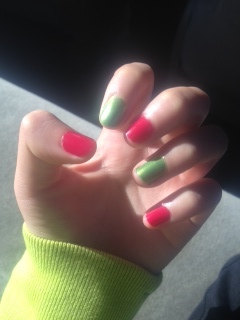 For Christmas, I decided to go with alternating red and green nails. 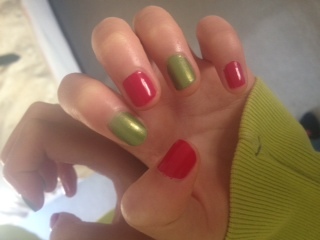 For red, I used Revlon Cherries in the Snow, and for my green, I used Wet n’ Wild Jade. Here are some pics of the finished product! 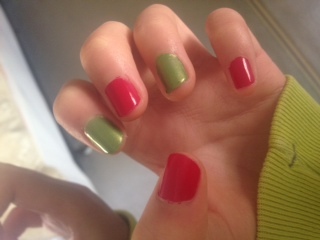 I used 1 coat of Cherries and 3 coats of Jade. Let’s begin the reviews…Let’s start of with Revlon Cherries in the Snow. One word- great! It was a one-coater, honest-to-God. It wasn’t streaky, and went on smoothly and easily. No bubbling either, which was great, because otherwise I would have…I don’t even know. Probably chucked the bottle out the window and dented someone’s car on accident. 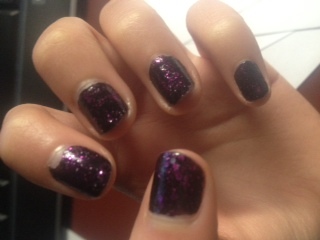 The only thing was that with this polish, the tip wear was SUPER EXTREME, as in tips missing after 2 days. 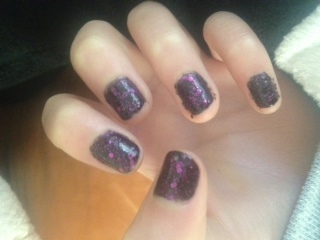 With a good top coat, however, I’m sure the tip wear would be minimal. As for Wet n’ Wild Jade, it was REALLY sheer, but I got it opaque in 3 coats, which is better than some polishes I’ve seen. There was barely any tip wear, and I had it on for a week, which was nice. It went on really nicely too. 🙂 That’s all the reviews for these polishes! NOTW+Review- Alert the police…I’m wearing pink! Sorry about the messiness...I was in a hurry. The following pictures are all from 1 week later. It’s amazing how little tip wear there was (AND NO CHIPS!!!! 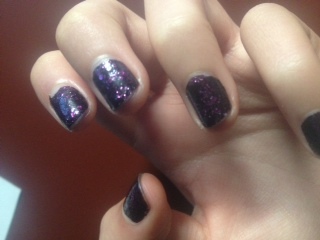 :D), but it was weird, because some of the glitter CAME OFF. Also, some of the glitter TURNED SILVER…what the heck? OMG I LOOK SO PALE! 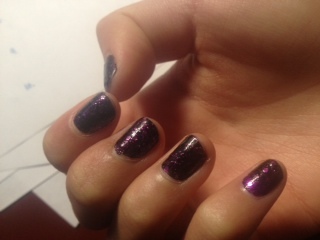 That’s all for the nails! Now, finally, we can move onto dessert! Some of you might be thinking that this heading has NOTHING TO DO WITH ANYTHING, but it should help you out with finding out the title. So let me start talking about the latter of the first item in the heading- The Key. As you may or may not have noticed, we’ve got some new pages! Though The Journey of P&P is pretty self-explanatory, The Key takes a little more work. Now for our contest…we will have 10 contestants total. In order to enter, comment on the “Contest!” page. Every week, there will be a challenge, and 2 people will be eliminated. Look at the “Contest!” page for more details. The winner will receive the password to “The Key” and a box of prizes, including nail polish (good brands, I assure you), eyeliner, lip gloss, and more! That’s it for our delicious (if I do say so myself, and I do) desserts! But wait, there’s more! (Love it when they say that in commercials x]) Doggie bags to bring home! That’s all for today, folks! Thanks for reading! Please comment and/or like if you think it’s worthy! THE STUFF OF SATURDAYS: the way we were. THE STUFF OF SATURDAYS: anti.